I still remember seeing the “Cookies” sign for the first time. Just off the corner of Smith Street, I was drawn to the bright blue storefront realizing with disappointment that they were closed for the night. Peering through the grating into the store (it was pretty sad), I knew I’d be back. 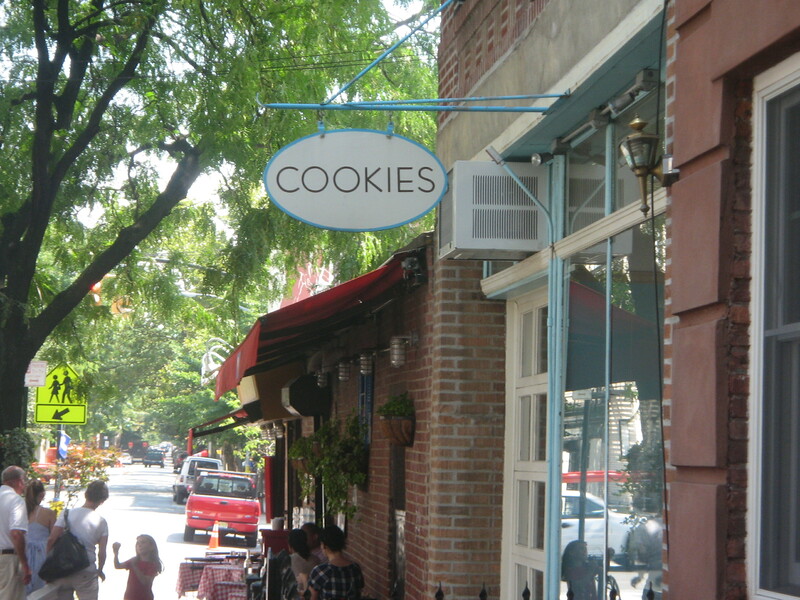 I reasoned that if an entire bakery was dedicated to just making cookies, they must be really good cookies. If the same cookies were displayed lovingly gift wrapped, they must be uniquely great. I’ve been scratching at their door ever since. Named One Girl Cookies, each cookie takes a woman’s name along with everything it evokes, so you have your pick of Lucias (chocolate layer bar), Sadies (orange butter cookies), and Juliettes (chocolate cinnamon), not to mention mini chocolate chip cookies and my favorite, pumpkin whoopie pies. It’s like having a tea party inside a Tiffany’s box. When I learned that they were going to start offering classes, I was the first to sign up. Thanksgiving was approaching, and they were teaching apple pie. I knew that if I was going to take over pie duty from my aunt, I had better get certified. I was not disappointed. The owners, Dawn and Dave Crofton, were everywhere at once. Unlike amateur classes that are mostly demonstrations, they encourage everyone to get in the mix, making it impossible to feel skittish or apprehensive about tackling pie crust, tarts or cakes. Most importantly, you feel that you’ve learned a basic concept that you can apply to a million other recipes you’ve wanted to try. 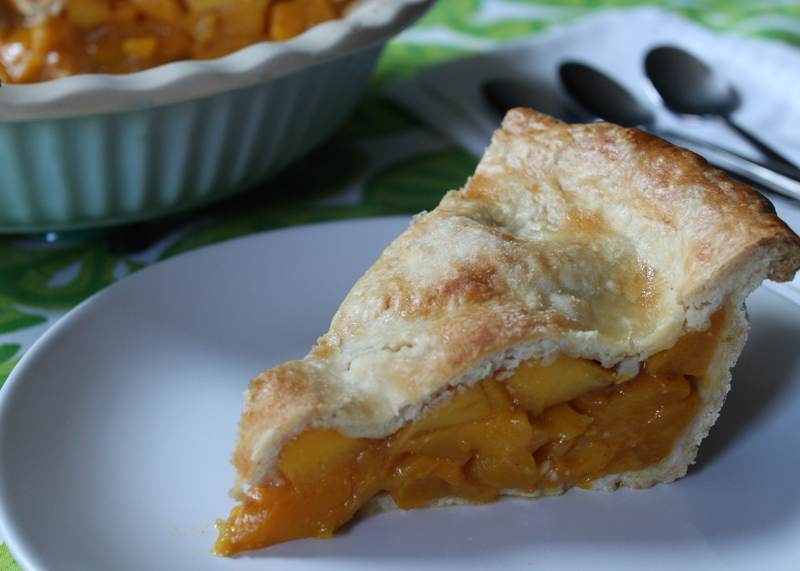 That’s why with November still a few months away and mangoes piling up, I felt comfortable taking their all-American pie crust and putting mangoes in it. 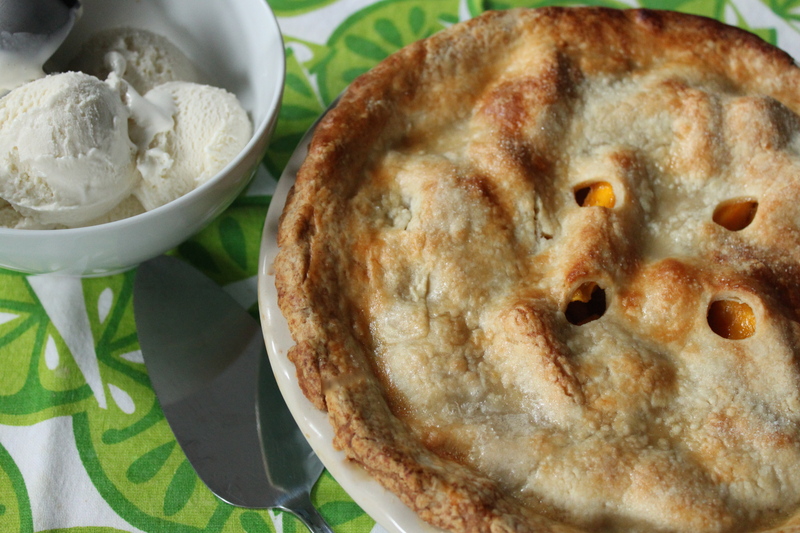 Adapted with permission from One Girl Cookies‘ recipe for apple pie. This double crust recipe calls for high quality butter kept very cold, instead of shortening, to produce a flaky crust. 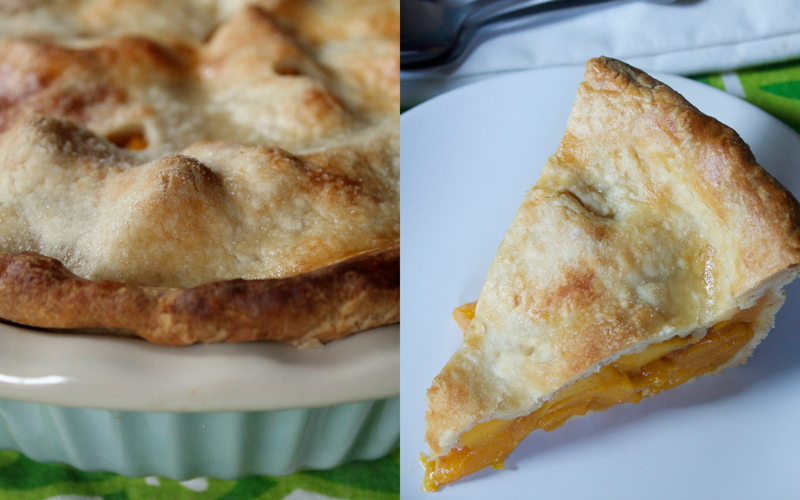 Similar to a classic apple pie, I switched out the apples for a mix of unripe mangoes that a have pear-like crispness and sweeter mangoes on the cusp. *The amount of sugar can be adjusted depending on the ripeness of the mango. Egg whites and sugar for dusting. Cube the butter and hold it cold until needed. Sift together all dry ingredients and pulse in the food processor, 1-2 pulses to distribute evenly. Add the butter and pulse together until the butter flakes into pea-size pieces. Add ice water gradually until reaching desired texture. Turn out the dough onto a lightly floured surface. For the fraisage or final blending, smear the dough a few spoonfuls at a time across the board with the heel of your hand. Gather the dough with a scrapper and form into a mound. Divide the dough into two separate disks. Wrap in plastic wrap and refrigerate at least 2 hours or overnight. Roll out single dough to about 1/8″ thick and place in pie pan leaving the edges long. In a large mixing bowl, add zest and lime juice to the sliced mangoes. Combine the dry filling ingredients and add to the mangoes. Scoop the filling in center of pie but do not pour in all the liquid. Roll out the second dough and place on top of the pie. Trim edges and crimp to design. 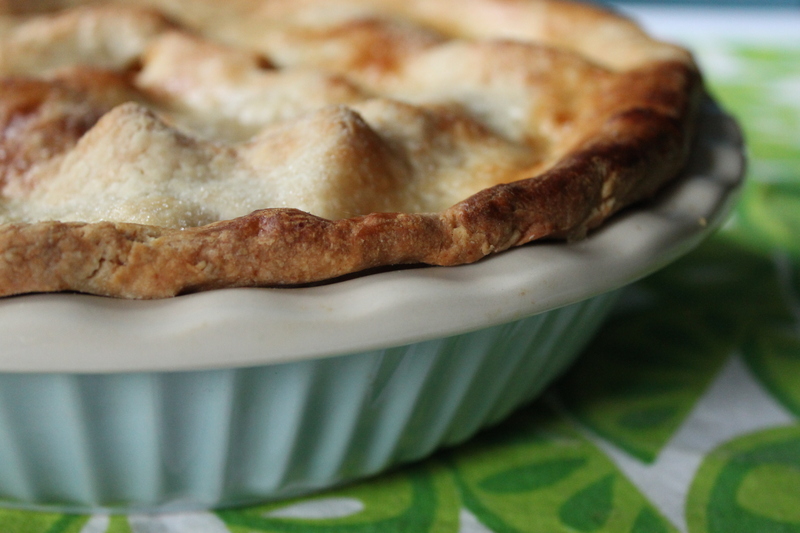 Using a sharp knife, cut tiny vents in the top of the pie. Brush with the egg whites and sprinkle the top with sugar. Bake at 425 degrees for 25 minutes, rotating once at the halfway point. Reduce heat to 300 degrees and continue to bake 30 minutes more till golden. One of the BEST pies I’ve ever had in my life! Hands down! I will be trying this recipe AND visiting the bakery VERY soon. Thanks so much for sharing. My husband made this for me for my birthday and it was awesome! I loved it! Good one Hungry Sofia!